For those who did not have the pleasure of attending the paper presented in the very first Cultures of Knowledge seminar series by the renowned scholar Professor Mirjam de Baar of the Faculty of Theology and Religious Studies at the University of Groningen (the podcast of this paper may be downloaded from our previous website), or for those who have not encountered before the subject of Professor de Baar’s research, I should like to introduce here Antoinette Bourignon, the Flemish spiritual mystic and prophetess, whose catalogue of correspondence became available in EMLO this week. EMLO is particularly fortunate to have worked with Professor de Baar to make available online the calendar of this remarkable woman’s letters. Born in Lille in 1616, Bourignon, who received no formal education or theological training, embarked upon — to quote Professor de Baar — ‘a spiritual voyage of discovery, one that led her to take a critical and independent stance in relation to the church and its doctrinal authority’. Bourignon, who felt herself compelled to gather together true Christians and professed herself chosen by God to restore true Christianity on earth, purchased and ran her own printing press in a bid to disseminate her message via a myriad of published epistles. Among Bourignon’s more-renowned followers were numbered the Dutch natural scientist Jan Swammerdam, the French theologian Pierre Poiret, the Anglo-Irish natural philosopher Robert Boyle (whose correspondence catalogue will be released in EMLO shortly), and one of the subjects of last week’s blog, Moravian-born pansophist Jan Amos Comenius. Large numbers of Bourignon’s disciples, both male and female, who gravitated to her from a wide spectrum of social backgrounds and political situations across the face of Europe, wrote to Bourignon for guidance on spiritual and personal matters, and their concerns and individual voices may be discerned clearly in Bourignon’s published responses. Where scans of Bourignon’s published letters are available online, EMLO provides links from the relevant letter record in the calendar and we urge you to take advantage of these to read some of her letters. Bourignon wrote a spiritual autobiography, published under the title La Parole de Dieu in 1663, and for further biographical information we could not recommend more highly Professor de Baar’s biography (‘Ik moet spreken’. Het spiritueel leiderschap van Antoinette Bourignon [1616–1680]), which was published in 2004 by WalburgPers. 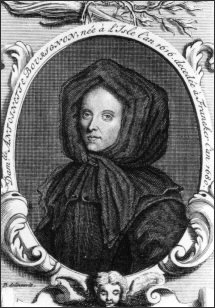 Bourignon is just one of a number of intriguing and influential early modern women whose correspondences are in preparation at present for inclusion in EMLO’s union catalogue. Within the next few months, for example, calendars for the correspondences of Amalia von Solms and of Elizabeth of Bohemia will be released and, of course, we are working with our long-term partners at the British Academy project Women’s Early Modern Letters Online, headed by Professor James Daybell and Dr Kim McLean Fiander; their collection of sixteenth- and early seventeenth-century women’s correspondence will be made available within EMLO and it will be possible soon to conduct searches either exclusively within the cluster of women’s correspondence or to expand out from this across the EMLO catalogue as a whole. These are productive times for the studies of early modern women, and we look forward greatly to publication of these catalogues as well as to the spotlight being shone onto the fascinating networks surrounding them when the prosopgraphical tools we are creating here in Oxford are brought into wider play. This entry was posted in Uncategorized on December 6, 2015 by Miranda Lewis.